The easy answer to this question is that they are the most popular, bestselling perennial in the world. That being said, let me give my two cents into why this is true. 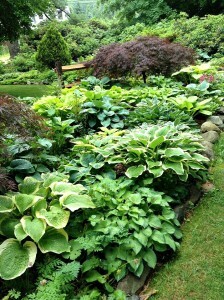 Hostas are shade tolerant perennials that are extremely hardy and require very little maintenance. They are shade tolerant, not shade loving. Most hostas prefer a bright east facing area with a few hours of direct morning sun. Hostas do very well in a filtered light situation under the canopies of trees and shrubs and not in a dark area with little light. They do not like to be placed in a heavily rooted area, especially with a lot of surface roots from trees where they will fight for moisture and nutrients. Some hosta cultivars depending on their lineage can handle quite a bit of sun. Fragrant hostas are good for sunnier locations because they have the species Hosta plantagenea in their genes. If you want to grow hostas in a mostly sunny location then you should amend the soil with compost and peat moss and supply adequate moisture for best results. We recommend amending the soil with compost and peat wherever you plant them as they love a nice fertile soil to thrive and achieve their true potential. My favorite part of growing hostas in a shaded area is the absence of noxious weeds. I have shade gardens that I might weed three times a season and sunnier gardens that need it weekly. I love walking through the shade gardens or sitting in a chair in the shade gardens on a nice summer day where the shade keeps you cool from the hot summer sun. A major pet peeve of mine or maybe just more of a disappointment is driving by a house with a large shaded area that is either barren or just mulched. This is a perfect area for hostas and companion plants. With a little bit of work you will be rewarded with a mass of reliable color and texture instead of weeds, leaves or just plain bark mulch. The goal should be to have people stop in front of your house to see the colors and textures of a beautiful hosta garden. Hostas are incredibly versatile plants as previously noted above but also because of the large range of colors and leaf shapes they offer. 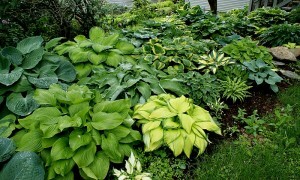 Hostas come in multiple variations of blue, green, gold, white and even red. Clump sizes can be as small as 2-3 inches tall and as tall as 4 feet. Hosta leaves come in a wide range of sizes, shapes and forms. Just look at the amount of adjectives used to describe hosta leaves and clumps on our website. From giant to miniature, cupped, flat, heart-shaped, lance-shaped, vase-shaped, corrugated, deeply veined, folded, rippled, glaucous, misted, streaked and twisted to name a few. A good hosta garden has a never ending array of colors and attributes. I love when you talk to someone about hostas and their reply is, “Oh, those green and white things?”. These people have no idea of the magnitude to what the species of hosta is capable of!